Proximity sensing no-touch unit dispenses a pre-set length per cycle from 8″ or 9″ wide standard towel roll up to 800 ft. (244m) long and has stub roll capability for continuous dispensing. Smaller waste receptacle, 13.5 gal. 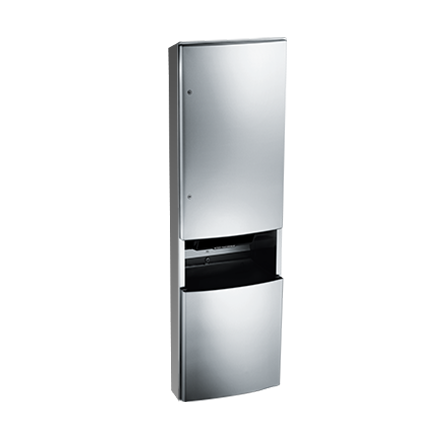 (51.1 L), allows unit to be ADA compliant. Internal shelf is ideal for paper towel storage. Towel length is determined by owner by setting length, delay and paper saver switches.